Langley (CVL-27), originally named Fargo (CL-85), was laid down as CrownPoint (CV-27) by New York Shipbuilding Corp., Camden, N.J., 11 April 1942;renamed Langley 13 November 1942; launched 22 May 1943; sponsored by Mrs.Harry L. Hopkins, wife of the Special Assistant to President Roosevelt; reclassified CVL-27, 15 July 1943; and commissioned 31 August 1943, Capt.NV. M. Dillon in command. After shakedown in the Caribbean, Langley departed Philadelphia 6 December 1943 for Pearl Harbor, where she participated in training operations. On 19 January she sailed with Rear Adm. Marc Mitscher's Task Force 58 for the attack on the Marshall Islands. From 29 January to 6 February the carrier'sair group conducted raids on Wotje and Taora to support Allied landings at Kwa.julein, and repeated the performance 10 through 28 February at Eniwetok. After a brief respite at Espiritu Santo, New Hebrides Islands, Langley hitJapanese positions on Palau, Yap, and Woleai, Caroline Islands, from 30 March to 1 April. She next proceeded to New Guinea to take part in the captureof Hollandia 25 April. A mere 4 cars later, the tireless carrier engagedin the 2-day strike against the Japanese bastion Truk rendering the formidablenaval base almost useless to the "Sons of Nippon." During theraid, Langley and her aircraft act accounted for some 35 enemy planes destroyed or damaged, while losing only one aircraft herself. Langley next departed Majuro Atoll 7 June for the Marianas campaign.On 11 June, Admiral Mitscher's carrier groups took over from the land-basedArmy Air Force bombers. At 1300 the Task force launched a strike of 208 fighters and eight torpedo-bombers against enemy planes and airfields on Saipan and Tinian. From 11 June to 8 August the battle raged for controlof the Marianas. The Allied assault on the key to Japan's inner defenses15 June forced the enemy to engage our fleet for the first time since Midway.During the 2-day Battle of the Philippine Sea, 10 to 20 June, the enemy suffered such serious losses that he was not able to again seriously challenge U.S. swooper until the invasion of Leyte. When Adm. Jisaburo Ozawa retreatedwith his battered Mobile Fleet, he was minus 428 aircraft and three carriers.Langley had added her strength to break this Japanese effort to reinforcethe Marianas. 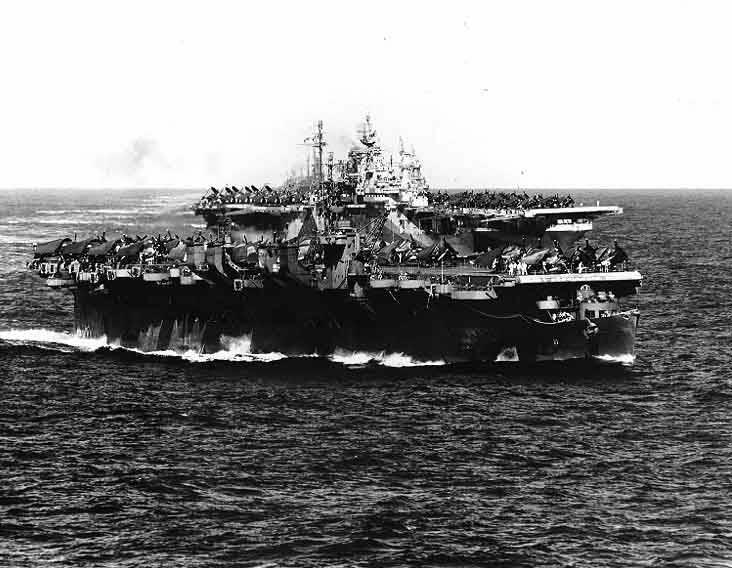 The carrier departed Eniwetok 29 August and sortied with Task Force 38,under the command of Adm. William F. Halsey for air assaults on Peleliuand airfields in the Philippines as the preliminary steps in the invasionof the Palaus 15 to 20 September. During October she was off Formosa andthe Pescardores Islands attached to Vice Admiral Mitscher's Fast Carrier Force. Later in the month, as the Navy carried General MacArthur back to the Philippines, Langley was with Rear Admiral Sherman's Task Group protectingthe Leyte beachheads. In a desperate effort to parry this deadly thrustinto her inner defenses Japan struck back with her entire fleet. On 24 OctoberLangley's planes helped to blunt the first and most powerful prong of thiscounteroffensive, Admiral Kurita's Center Force, as it steamed toward theSan Bernardino Strait and the American beachhead. The following day, uponword of Japanese carriers north of Leyte, she raced to intercept. In the ensuing battle off Cape Engaiio, Mitscher's force pulverized the enemy fleet.The Japanese lost four carriers, two battleships four heavy cruisers, one light cruiser, and five destroyers. Langley's aircraft had assisted in the destruction of the carriers Zuiho and Zuikoku, the latter being the only remaining carrier of the six that had participated in the Pearl Harbor attack.Japan's chances for final victory had been reduced to nil by the great Battle of Leyte Gulf. During November Langley was lending her support to the Philippine landingsand striking the Manila Bay area, Japanese reinforcement convoys, and Luzonairfields in the Cap Engafio area. On 1 December the flattop withdrew toUlithi for reprovisioning. During January 1945 Langley participated in the daring raid into theSouth China Sea supporting Lingayen Gulf operations. Raids were made againstFormosa, Indo" China, and the China coast from 30 December 1944 to25 January l945. The thrust into the area, which the enemy had considered a private lake, netted a staggering number of Japanese ships, aircraft,supplies, and destroyed installations. Langley next joined in the sweeps against Tokyo and Nansei Shoto in support of the conquest and occupation of Iwo Jima 10 February to 18 March. She next raided airfields on the Japanese homeland, and arrived off Okinawa23 March. Until 11 May, the ship divided her attention between the Okinawa invasion and strikes on Kyushu, Japan, in an effort to knock out kamikazebases in southern Japan which were launching desperate and deadly attacks. After touching Ulithi and Pearl Harbor, she steamed to San Francisco,arriving 3 June for repairs and modernization. She departed 1 August forthe forward area, and reached Pearl Harbor 8 August. While there, word arrivedthat hostilities had ended. She completed two "Magic Carpet" voyages to the Pacific, and got underway 1 October for Philadelphia. She departed from that port 15 November for the first of two trips to Europe transportingArmy troops returning home from that theater. She returned to Philadelphia 6 January 1946 and was assigned to the Atlantic Reserve Fleet, Philadelphia Group, 31 May. She decommissioned 11 February 1947, and was transferredto France under the Mutual Defense Assistance Program 8 January 1951. In French service she was renamed La Fayette (R-96). The carrier was returnedto the United States 20 March 1963 and sold to the Boston Metals Co., Baltimore,Md., for scrapping. Langley received nine battle stars for World War II service.